The tabs preview feature in IE9 displays a small thumbnail of the web page when users hover the mouse over the IE icon in the taskbar. This lets users quickly find the tab that they want. Although it is a convenient feature, it can also reveal sensitive information through the thumbnails. The additional graphics can also slow lower end systems. Luckily, you can easily disable this feature. 1. Launch IE 9 browser. 2. Click the small gear icon on the top right of the interface, and then go to Internet Options. 3. 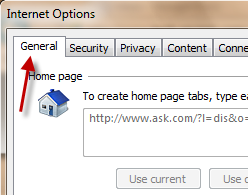 In the Internet Options window, go to the General tab. 4. Find the Tabs section, and click on the Settings button. 5. In the Tabbed Browsing Settings window, uncheck the Show previews for individual tabs in the tasbkar option. 6. 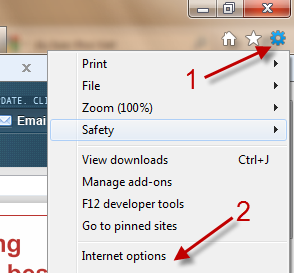 Click OK to save the setting, and close all remaining Options window. 7. Restart your browser to see the changes. Please note that when this feature is disabled, you will still see one tab preview in the taskbar. This is the Windows 7 taskbar preview feature, you can not disable it for IE 9 only.